US Network Starz has acquired the rights to ‘Dublin Murders’, a new eight-part TV series based on Tana French’s ‘Dublin Murder Squad’ novels, which is being adapted by Sarah Phelps for the BBC. 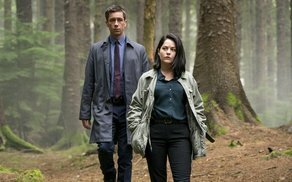 The psychological crime thriller will be led by Irish duo Killian Scott (‘Damnation’) and Sarah Greene (‘Rosie’) who will play detectives Rob Reilly and Cassie Maddox, and is set to feature on BBC One, Starz and RTÉ with support from Northern Ireland Screen. ‘Dublin Murders’ is drawn from Tana French’s internationally bestselling Dublin Murder Squad novels. Each book is led by a different detective from the same team and their signature is an intense emotional connection between cop and crime. This eight-part series is created and written by Sarah Phelps (‘And Then There Were None’, ‘Ordeal by Innocence’) and blends the first two novels, In the Woods and The Likeness to deliver a dark psychological mystery with a tap root that drops deep down into Ireland’s past, foreshadows the future and brings insight to its present. ‘Dublin Murders’ boasts a strong Irish cast that includes Tom Vaughan-Lawlor as Frank supported by Moe Dunford as Sam, Leah McNamara as Rosalind, Ian Kenny as Phelan, Eugene O’Hare as Quigley, Jonny Holden as Damien with Conleth Hill as O Kelly and Peter McDonald as Jonathan. The 8x60’ series is produced by Carmel Maloney, the lead director is Saul Dibb (The Duchess, Suite Francaise, NW), supported by John Hayes (Bancroft) and Rebecca Gatward (Shetland). The series was commissioned by Piers Wenger, Controller of BBC Drama, Charlotte Moore, Director of BBC Content and Susan Lewis for Starz and will be produced by Euston Films, Element Pictures and Veritas for BBC One, Starz and RTÉ with support from Northern Ireland Screen. The executive producers are Sarah Phelps and Saul Dibb; Noemi Spanos and Kate Harwood for Euston Films, Ed Guiney for Element Pictures, Alan Gasmer and Peter Jaysen for Veritas Entertainment Group and Elizabeth Kilgarriff for the BBC. ‘Dublin Murders’ is due for release in 2019.